Posted under Health Guides. Updated 4 October 2016. Zinc is important for your immune system. Your body can’t make zinc so you need to get it through your diet. 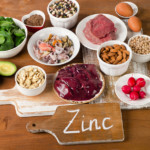 Teenage girls need about 8-9mg of zinc every day.